This how-to explains how to install the ByteBlower Wireless Endpoint onto your device. You can download and install the Wireless Endpoint from the download page. For now we only support Debian 8 (jessie), Ubuntu 14.04 LTS (trusty) and Ubuntu 16.04 LTS (xenial). You can download a small deb file which will configure the Debian/Ubuntu APT repositories for you. When installation is complete, the ByteBlower Wireless Endpoint can be installed using the standard software management packages for your distribution. For RPM based systems, we provide the Excentis yum repositories. You can download the packages to initiate the repository configuration on our download page. 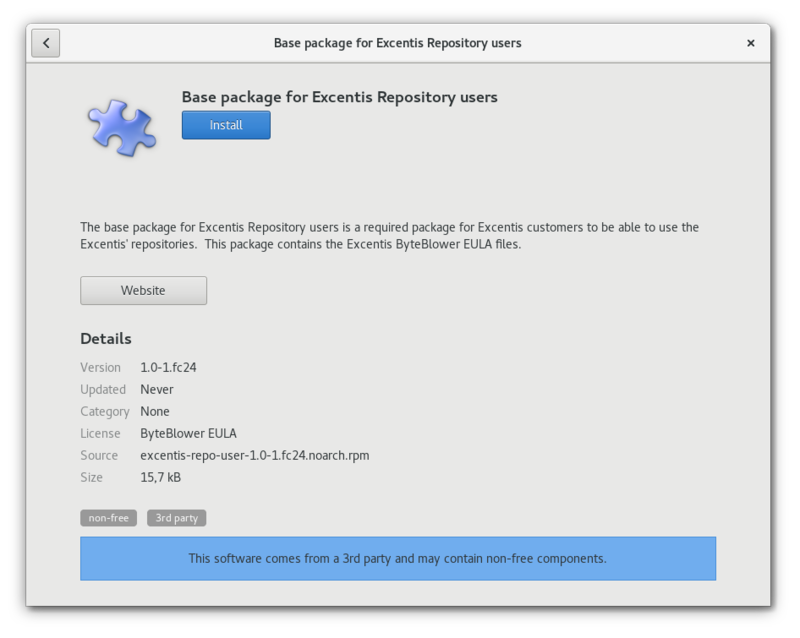 To initialize the excentis repository, Install the two downloaded files. This must be done as either privileged user or user root. Open your downloaded packages from your file manager and click on the Install button. The CentOS package requires the EPEL-release extra repository for some Wireless Endpoint dependencies. Installation via GNOME software will be available soon.